Multiple exposures on the single photo for the android camera. Manual HDR image processing; with or without exposure compensation. Color mask (key color), exposure, transparency, brightness, and contrast post image processing. Note: JH LABS Image Process Java Library (ported to android) is used on the some of the post photo adjustments. New Double Exposure: start new double exposure image. 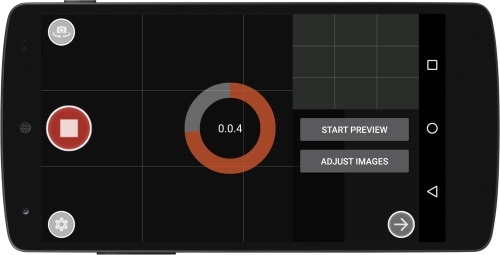 Adjust Image: post image processing, manual HDR processing, and more. Save: saves current images to the file, and the images information to the file ".dexp" extension. Close: close currently opened images, (save information). 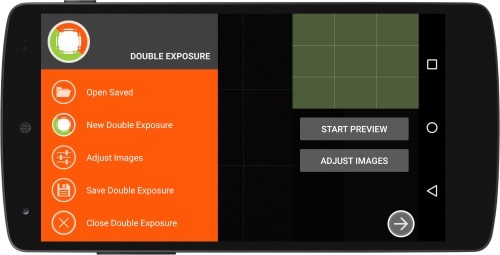 Start or Stop Preview: realtime multiple exposure preview. 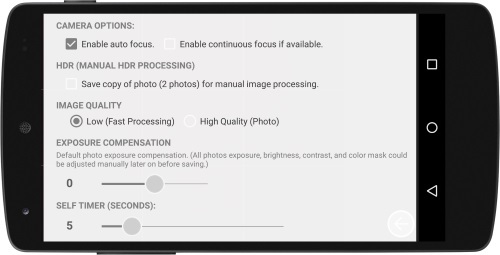 Auto focus, continuous focus options.  HDR (Manual Processing): when this option is selected, app will save another copy of newly captured photo. 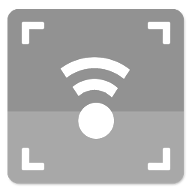 Image Quality: low preview quality or high quality photo option. Self Timer: 0 to 30 seconds. If selftimer is set, the timer remaining animation will be appeared. 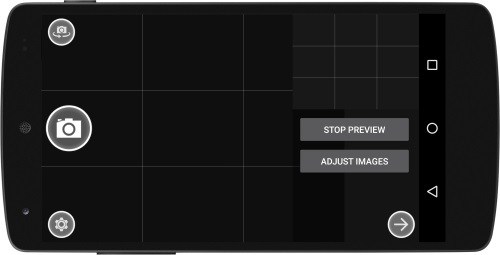 Master output and selected image preview screen. 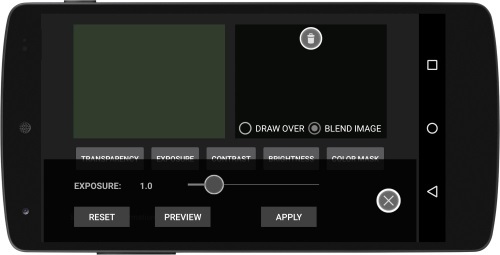 Image Processing: transparency, exposure, contrast, brightness, color mask processing options. Photos: image orders could be easily changed, and could be removed if not needed. 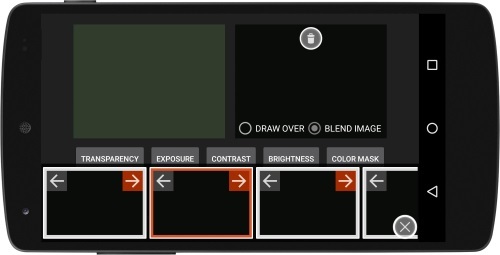 Image Overlay Options: Draw Over (selected photo will be placed over the previous photo), Blend Mode (selected photo and previous photos will be blended together). Manual Color Selection: select a color to remove from selected image. Pick Color: user could select a color from the image. RESET: reset the image as previous state before the preview processing. 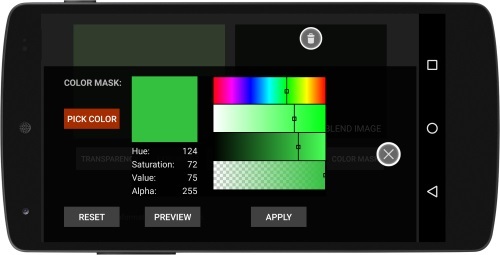 PREVIEW: process the photo image with adjust (color mask) option or values. APPLY: selected original photo image will be processed.